For my birthday Eileen sent me some Rowan Baby Alpaca. It's delightfully soft and I'm guessing it will be very warm. With some forward planning I cast on for a cardigan for next winter. The pattern is Jess by Martin Storey. The colour is more of a true red than this photo looks to me - it looks less pink in reality. Don't know what happened there...impromptu blogging break: things at work are busy and school is winding up for the end of term. So far it's easy TV knitting - and the increase/decrease rows for the ruffling pattern are manageable at the moment. 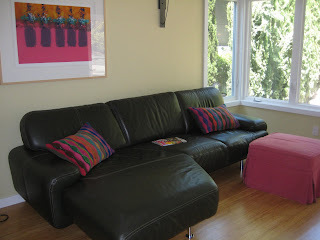 Now we are using our new living room the Lizard Ridge blanket lives in there. I thought our new sofa needed some cushions and when Kerstin and I went to IKEA last time we bought some valentine's themed cushions for $1.99 with a view to using the inserts. I used the leftovers of Noro Kureyon, along with some additional balls to make these cushions. 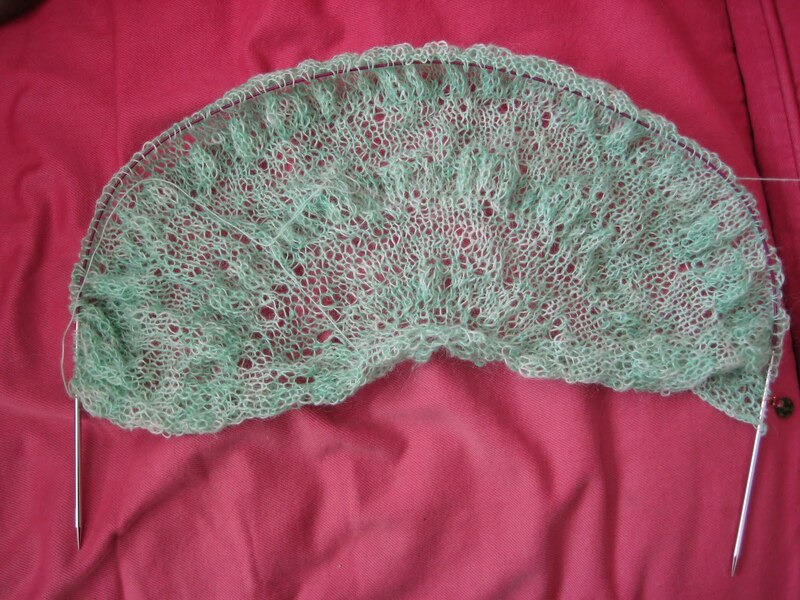 I followed the Lizard Ridge pattern, with 5 'bubbles' and knitted until it seemed big enough! I sewed them onto a brown denim back with an envelope closure. The denim has been in my fabric box for an eternity - I think I bought it at John Lewis which would make it at least 13 years old. I finished the Buttercup top. This was knitted in Garnstudio Drops Silke Tweed yarn that I got from Duncan for Christmas. 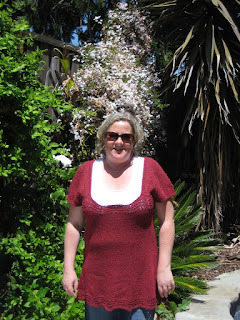 I am not thrilled with the outcome this project: the neckline is very wide and I knitted several decrease rows across the back neck - it is still too wide to wear without a t-shirt underneath. And of course it's also too low-cut to wear without a t-shirt. 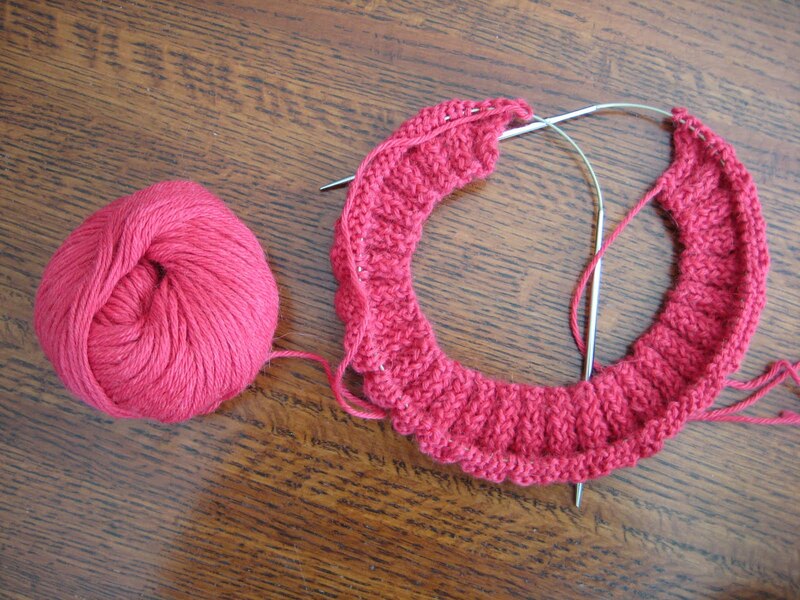 The yarn grew in length quite considerably during blocking - and I may try to block it again to tighten the stitches. The yarn is lovely, quite nubbly, and knitted at this tension it's very drapey - possibly too drapey. I think if I knitted this again I would knit an even smaller size to get a better width across the neck and shoulders, and would not pick up any stitches at the underarms. I already knit a size smaller than I would normally chose because of the width at the shoulders - but I think this is a perennial issue with top-down raglan construction. It would be better with narrower shoulders and short-row bust shaping on me. So - on balance, a nice pattern, but in need of more customization for me. I will see how much I wear the tunic and maybe re-block. Otherwise the yarn might be destined to become something else!